The Wee Kim Wee Centre is proud is to present Our Fourth Annual Distinguished Lecture on Educational Leadership on Friday, 19th October 2018. This year’s Lecture will be delivered by the Distinguished Professor Claudia Costin. With the generous support of TVI (Training Vision Institute), the Annual Wee Kim Wee Distinguished Lecture on Educational Leadership has been set up under the auspices of the Wee Kim Wee Centre here at SMU. This is the 4th session out of a series of five. The previous three lectures were delivered by Lord David Alton, Datin Paduka Marina Mahathir and Ngugi wa Thiong’o. 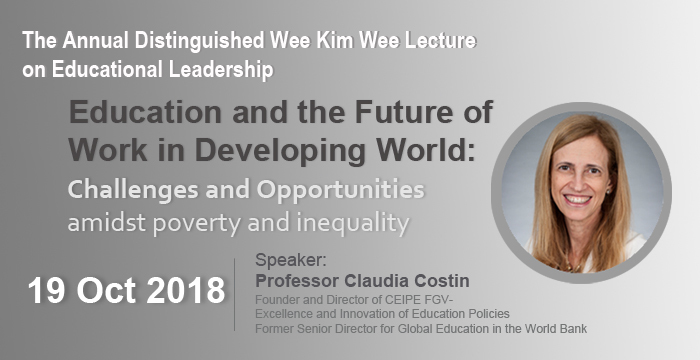 This year we are so very honoured to have Professor Claudia Costin, Founder and Director of CEIPE FGV- Excellence and Innovation of Education Policies, former Senior Director for Global Education in the World Bank to address us. In September 2015, the United Nations General Assembly approved the Sustainable Development Goals-SDG, one of them devoted to Education, the SDG-4 that states that the countries would “ensure inclusive and equitable quality education and promote lifelong learning opportunities for all”. This translates into targets such as “By 2030, ensure that all boys and girls complete free, equitable and quality primary and secondary education leading to relevant and effective learning outcomes”. Unfortunately, although important progress has been made in access, many young people are still lagging behind in access, inclusion and especially in learning, as the recent World Development Report 2018 – Learning to Realize Education’s Promise- from the World Bank has shown. The proportion of children and adolescents in Primary and Secondary is growing, but they are not learning and are too often leaving schools to work or even to be in the margins of society. This is particularly true in the developing world. For those who missed the lecture, you can watch it @ Education and the Future of Work in the developing world. Claudia Costin is the Founder and Director of CEIPE FGV- Center for Excellence and Innovation of Education Policies, think and do- tank within Getulio Vargas Foundation, a leading private University in Brazil where she is a professor. She is a visiting professor at the Harvard Graduate School of Education and was in the recent past Senior Director for Global Education in the World Bank. Before joining the World Bank, Claudia Costin was Secretary of Education of the municipality of Rio de Janeiro. Under her stewardship, learning results rose by 22 per cent in the city. She also implemented a strong Early Childhood program, working seamlessly across sectors with the Health and Social Protection secretariats. Claudia has been vice-president of the Victor Civita Foundation, dedicated to raising the quality of public education in Brazil. Believing in the transformational power of education, she helped create the civil society movement Todos pela Educação, also serving on its technical committee. Convinced that teacher motivation is critical for real learning, Claudia communicates with thousands of teachers using social media. Her former positions include Secretary of Culture, Sao Paulo State and Federal Minister for Public Administration and State Reform. Claudia has held academic positions at the Catholic University of São Paulo, Getulio Vargas Foundation, INSPER Institute of Education and Research and École Nationale d’Administration Publique in Quebec. She has a Master's Degree in Economics from the School of Business Administration of São Paulo at the Getulio Vargas Foundation and a PhD level in Administration at the same school. She is also a member of the Global Commission for The Future of Work at ILO – International Labor Organization, an agency at the United Nations.